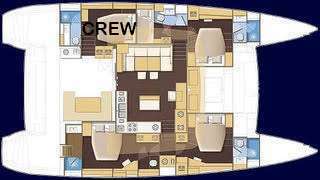 Viramar, a Lagoon 56, is available for crewed charter vacations for parties of up to 8 guests in 4 Queen (or 3 Queen and 1 Twin) en&#45;suite cabins. The catamaran offers comfortable exterior lounge and dining areas, combined with a spacious and bright interior. Viramar has a fabulous flybridge offering a 360-degree view of the Caribbean, a forward cockpit for cocktails plus there's a large aft cockpit for lounging and alfresco dining. The yacht’s master cabin has a very large en-suite bath with electric head and separate stall shower. The master cabin is accessible from the salon and also has access directly to the aft deck. There are another 3 queen cabins each with a private en-suite bath with electric toilet and stall shower. In addition there is one twin bunk cabin with a private bath, electric head and stall shower. Set sail for a relaxing, fun vacation aboard Viramar. They were voted Best Crew in Show” in their category at the VI Professional Charter Association’s 2017 USVI Charter Yacht Show. Combined, their southern hospitality and love for fun will ensure your vacation here in the islands is full of unforgettable memories. Contact us for rates and current availability or to book a charter aboard Viramar! Scuba Terms Includes 5 dives per week for certified divers, Discover Scuba course available for non-certified guests. Tyler and Erika were both great. They both showed extensive knowledge and we were always sure we were safe and well cared for. Professionally, they were spot on. But what really was terrific about both Tyler and Erika was how they personally invested themselves into sharing their local knowledge and other skills to help our family have the best trip possible. Whether it was the cooking, or the scuba training, or the ushering us around the great spots they suggested- they made sure we had a fantastic trip. Perfect. The boat was great- very clean, and very comfortable. I loved sleeping outside under the stars (with my daughter) a couple nights, and the dinghy made getting out and about an easy experience. The food was fantastic, it was expertly prepared and a lot of obvious thought put into matching our tastes. We loved the (active) itinerary that we enjoyed, and the destinations were special and fun. Tyler and Erika obviously listened to what we thought made sense, and then made sure our stops fit in the most entertainment possible.